Automologist LING reports on the new road safety system in Malaysia. I couldn’t help it. This KRU song, popular during my school days, became an earworm in my head after I read The Star newspaper’s report that the Road Transport Dept (JPJ) has activated the AWAS system, ie. Automated Awareness Safety System (shouldn’t it be called AASS, instead? Never mind…). 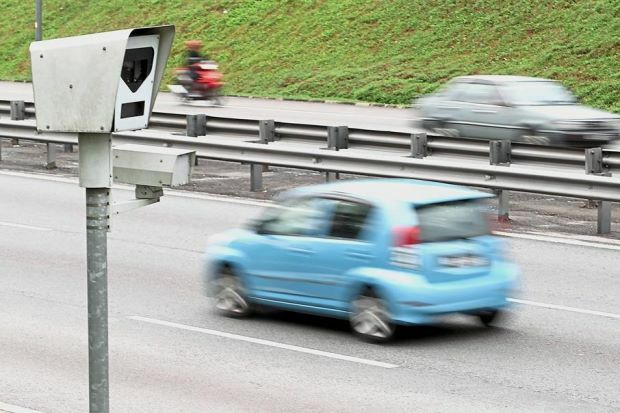 The system that came online on Saturday (April Fools joke it was not) combines the Automated Enforcement Cameras (AES), which automatically detects speeding and red-light-running, with the Demerit Points System (Kejara). So, Malaysians who have been blissfully ignoring road rules without any consequence will soon find their license suspended and be slapped with 150 ringgit fines. Under the Kejara system, motorists collect demerit points for various traffic offences, and after enough strikes, YOU’RE OUT! For instance, driving under the influence would see you rack up 15 points immediately while the vague offence of “careless driving” would add 5 points. After the first 20 points accumulated, motorists will be issued a warning; 40 points, and the license will be suspended; 60 points, the license revoked. Get the deets here and here. For now, the system uses AES cameras in 14 locations across the nation. Yes, only 14. That’s no more than their initial and, if I remember correctly, disastrous introduction back in 2011. The cameras were temporarily disabled when the public began questioning its legality as it was then operated by private firms. The gomen finally took over and, in a report last November, the AES has racked up 1.6 million summonses since starting operation. And the location of these cameras – 10 fixed and 4 mobile – are no secret. In fact, there are road signs clearly indicating that you are approaching a “camera zone”, which are usually accident-prone sections of the roads. The AES is after all not a punitive measure, but a preventive one. In 2014, the Malaysian Institute of Road Safety (Miros) conducted a study on the system and found there was an 88% reduction in red-light-running at traffic lights where the cameras were installed. In various countries where the AES has been implemented, road fatalities were seen to have decreased. As someone who is NOT a habitual traffic offender (my last offence is not buying a parking coupon because I didn’t know DBKL requires it on a Saturday), I’m pleased that there is progress in curbing road accidents. The focus is of course not to help the gomen make more money, although my dear readers would be quick to jump to that conclusion. The whole point of AWAS is to save lives. So, before you get angry and say the gomen is doing this to make money off you, then STOP BREAKING TRAFFIC RULES DO YOU DON’T OWE THE GOMEN ANYTHING!